This photo has an interesting unintentional effect, appearing as if it was taken with a fisheye lens. Here's a larger version. Yesterday I had a long discussion with a thoughtful man about the dearth of God's Word in our land and even in so many of our churches. I've spent a lot of time studying current trends in the "popular" church. All through the years of my ministry I've been quite wary of popular fads, teachings and trends. I suppose I always resisted whatever new thing was coming around unless I found its foundation to be solid scripturally and its teaching fruitful in the lives of believers. So many times these trends have proven over time to be just passing fads, often with a dollar sign attached to the promotions of such. My commission is clear: "Preach the Word." Last night our family sat in a double-length bench type pew at Roxbury Holiness Camp. It was the typical camp style pew where it had a partial back for support and this one even had a carpeted seat for comfortable padding. Sitting in front of us was the man that I had spoken to earlier in the day. 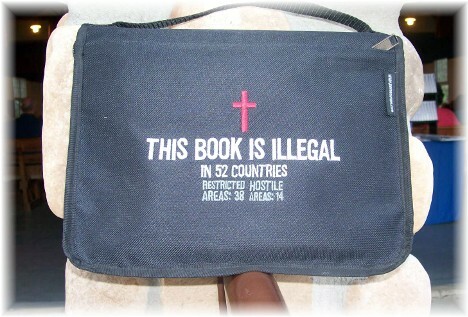 I was intrigued by the message on his Bible cover which he had sitting beside him on the bench. It reminded me of the oft taken for granted blessing of having access to God's Holy Word. It's especially heartening to know there are readers in this series who live in these countries and we're so glad they're able to get a small dose of this living and enduring Word of God using the internet. In the afternoon Brooksyne worked in the dish room with a woman who moved here from China in the 90's. She belonged to the underground Chinese church and was able to move to the states when her father got a job here. A graduate of a Christian college she now raises her children in the ways of the Lord. 1) The Word of God is living. The writer of Hebrews uses this very phrase when he says "the Word of God is living" (4:12). The living God imparts spiritual life through His living Word. I once read the story of a street evangelist who had placed his hat on the ground and drew a crowd by pointing at it and shouting, "It's alive". When a group had gathered around him he lifted up his hat to reveal a Bible! 2) The Word of God is enduring. The Psalmist wrote, "All your words are true; all your righteous laws are eternal" (119:160). No other written work comes even remotely close to the Bible in its enduring qualities. Peter concludes the chapter with this powerful truth: "All men are like grass, and all their glory is like the flowers of the field; the grass withers and the flowers fall, but the Word of the Lord stands forever. And this is the word that was preached to you" (1 Peter 1:24,25). Today we join hundreds of millions of believers all around the globe who are reading, studying and applying the truths of sacred Scripture to their lives. Many will be proclaiming this life-giving Word to others as we are through this encouragement message. And today scores of highly dedicated translators will be working in the remotest areas of the world to translate God's Word so that all might know of God's love and redemption plan. Praise God for the "living and enduring Word of God"! Continue to subject yourself to its life-giving qualities and present them to others! We must be very careful not to dilute or "dress up" the Word to make it more palatable to the masses. It is the individual's heart that Christ is most concerned about, not the impressive stats that we glowingly report to others used often to measure our own personal "success." Preach the Word, my friend, and continue to "declare the praises of Him who called you out of darkness into His wonderful light. Dear friends, I urge you, as aliens and strangers in the world… live such good lives among the pagans that, though they accuse you of doing wrong, they may see your good deeds and glorify God on the day He visits us" (I Peter 2:9,11,12). Daily Prayer: We thank You, Father, for the living Word of God that is sharper than any double edged sword. It penetrates even to dividing soul and spirit, joints and marrow. It judges the very thoughts and attitudes of our heart. Help us to align our thoughts and attitudes with the enduring Word of God. You are the Creator and we choose to conform to Your will and live within Your instruction. In the name of Jesus we pray. Amen. Brooksyne's note: Hebrews 4:12 & 13 are two verses I've been meditating on in the past few weeks. It has been of great blessing to me and a reminder that God sees all things and is the Judge of all that we do and say. 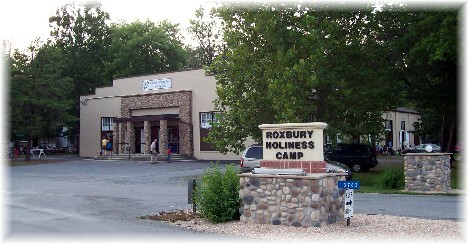 Yesterday we went as a family to Roxbury Holiness Camp in Franklin County PA right at the foot of Blue Mountain. 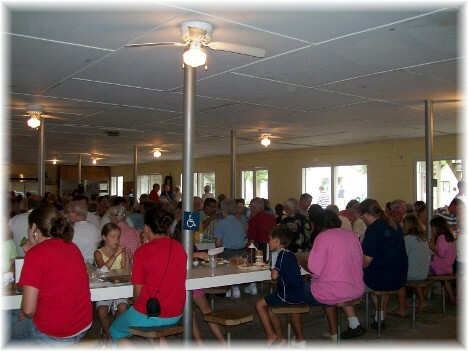 The camp is celebrating its 75th anniversary. The main tabernacle is an imposing block building seating perhaps a thousand people on wooden benches. It was pretty full for the service last night. Yesterday morning a message so needed in our time was shared titled, "The Case For Modesty." We were not in on the session but listened to the CD on our way home and appreciated the call to holy living through the way we appropriately cover ourselves. 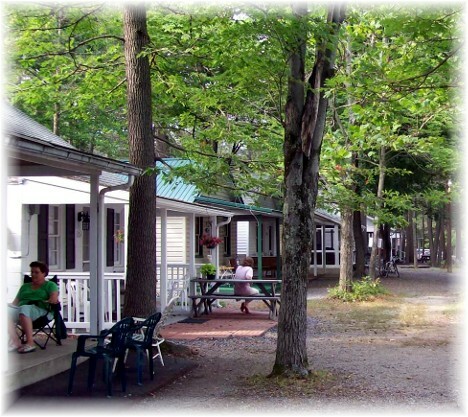 Many of the people stay the entire week in small cabins in a grove-like setting, reminding me of similar camps in Cherry Tree, PA and Excelsior Springs, Missouri. 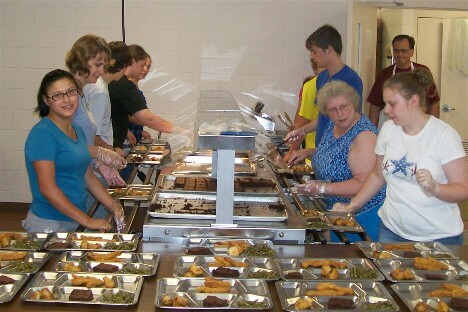 We all helped out serving the meals, serving over 800 people in a short amount of time. Brooksyne worked in the traywashing area and Stephen collected dirty trays on one shift and scooped freshly cut tomatoes on the tray for the supper meal. It was hard work but pleasurable as we worked among eager volunteers! 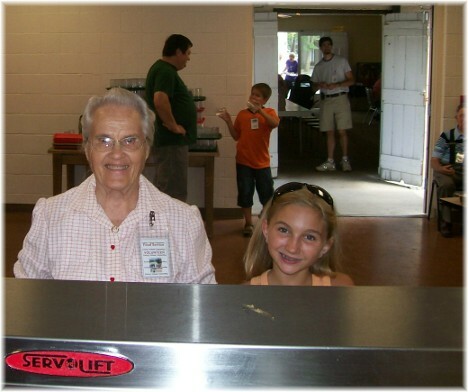 All ages were involved preparing and serving; from Wilma, in her mid-eighties, to this happy little girl who must have been age 12 (the minimum age for helpers). Wilma's husband Jesse is seen in the background counting people leaving the serving area. Note: Due to our trip to Roxbury Camp we did not post a message yesterday (Thursday, August 5, 2010).